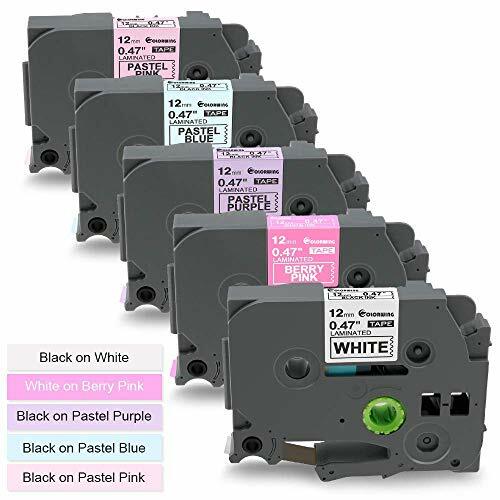 Package Includes: 5 colors label tape: TZe-231(black on white)/TZe-MQP35(white on berry pink)/TZe-MQF31(black on pastel purple)/TZe-MQ531(black on pastel blue)/TZe-MQE31(black on pastel pink). You can choose different color tape what you need. Size:12mm(1/2 inches). Split backing in the middle makes the labels very easy to peel off. No sticky residue remains when the labels are removed. 100% Warranty: 3-Year Replacement Warranty against manufacturer defects and quality-related issues. 100% Money Back Guarantee if you are not satisfied. All of our products have been tested strictly its compatibility and the printing quality for many times. Indoor or Outdoor Use: The TZe laminated label tape is strong adhesion, easy peel, water resistant, fading resistant, abrasion resistant, chemical resistant, high temperature resistant as well as grease resistant. Perfect Compatible with Brother P Touch Label maker: PT-D210, PT-D400, PT-D400VP, PT-D450, PT-H110, PT-E500, PT-P750W, PT-1230PC, PT-1880C, GL-100, PT-1000, PT-1000BM, PT-1010, PT-1010B, PT-1010NB, PT-1010R, PT-1010S, PT-1090, PT-1090BK, PT-1100, PT1100SB, PT-1100SBVP, PT-1100ST, PT-1120, PT-1130, PT-1160, PT-1170, PT-1180, PT-1190, PT-11Q, PT-1200, PT-1280, PT-1280SR, PT-1280VP, PT-128AF, PT-1290, PT-1290BT, PT-1290BT2, PT-1290RS, PT-1300, PT-1400, PT-1500, PT-1500PC, PT-1600, PT-1700.